so my question is: is it possible to extrude black areas of a high contrast image to an 3d object - which also could be manipulated by a noise patch?! I'm looking for it for quite a while but maybe it's really simple and I just can't see the forest for the trees?! I really would appreciate any hint or help! Here's one part of a potential solution to your problem. My other suggestion, go to Apple's Developer site, register if you haven't already done so, student is entry level, download the QuartzComposer OpenCL code [http://developer.apple.com/library/mac/#samplecode/OpenCL/Introduction/Intro.html] - look closely into the Text Extrusion example, especially the vertex displacement component. I'm running OS 10.5 though - thought I could manage with the kineme 3d bundle - But as I added the tag - extrusion to my post I stumbled over the OpenCL video by gtoledo3 - I guess that's what you mean. I accomplished something similar see attached file. 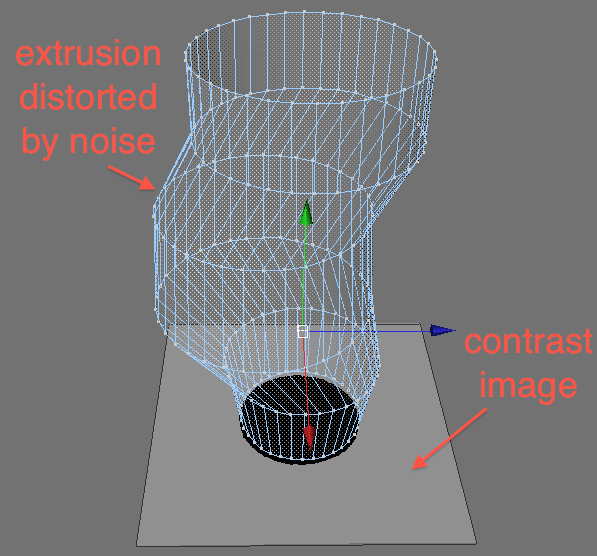 But I want to have smoother/precise outlines of the contrast image - like splines in a CAD program ( http://www.optiyummy.de/images/Software_CAD_-Tutorial-Bauteil-_basiselement_extrusion_quader.gif ). My final goal is to have something looking like the image attached - created by a black spot of a high contrast image. But first of all I'm going to update my osx. in which case, Kineme 3D should be your friend, as it also would be on 10.6.x. If I were you, if at all possible by all means update your OS but do retain a partition as a startup disk for 10.5.x, you'll find it ever so useful. The attached example is based upon the RuttEtraSphere composition by Smokris, itself a derivation of and development upon Fisheye by cwright. sorry should have mentioned in the beginning. I updated now to 10.6, but because of lack of disk space I had to replace the old. Thanks again! But I have difficulties to translate it to what I want still. I hope I'll manage it. Should be possible to link the diameter of the cylinder to a black spot of an image, and after that manipulate it like in your sample?! I made a better sketch of what I exactly want. But maybe I have to try processing or vvvv?! ok thats what i managed so far (see attachment) - but maybe with the help of the picture of my setup you can imagine what i want to achieve. 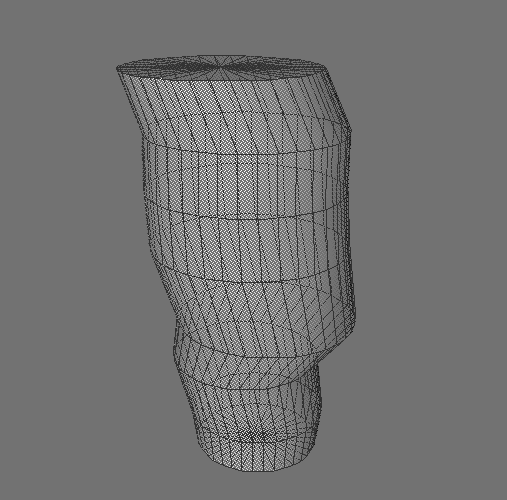 even though this thread is going down, maybe still somebody has a hint how i can get a cylinder exactly deformed to the outline of the black clay - which can then be manipulated? !